Andrew ‘Freddie’ Flintoff MBE is a former England Cricket Captain and one of the UK’s favourite sports characters. Born in Preston, Flintoff started playing cricket for Dutton Fawshaw CC. His first representative cricket was for the Lancashire U11 team. He continued up the ranks within Lancashire, making his first class debut in August 1995 against Hampshire. He made his Test match debut for England in 1998 against South Africa, followed by his One Day International in 1999 against Pakistan. Freddie Flintoff made a huge impact for England in the summer of 2005, when he played a major role in bringing the Ashes back from Australia. His achievements were legendary, and led to him being named BBC Sports Personality of the Year and being awarded an MBE in the New Year’s Honours List. In September 2010, having become one of the biggest players and best known characters in cricket, Flintoff retired from cricket due to a recurring knee injury. 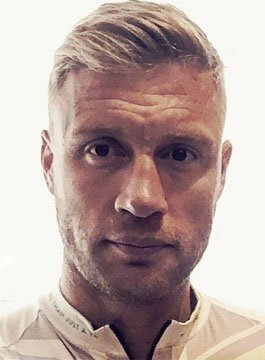 In early 2016, Flintoff was elected the new PCA President of the Professional Cricketers’ Association. Since retiring from cricket Freddie has developed a diverse and credible broadcasting career. Freddie vs The World for ITV2 in which he went head to head with some of the world’s sporting greats in a variety of daring challenges across the globe. Alone in the Wild for the Discovery channel. Freddie was completely isolated without any aid, help or production team, making his way through the wilderness with only a handheld camera to record footage. The Hidden Side of Sport for BBC1 – This documentary took an insightful look at depression in sport and how it is dealt with. From Lord’s to The Ring for Sky 1 which exposed the gruelling journey Flintoff had to face in becoming a heavy-weight boxer. The culmination of this was a victory on his debut at The MEN Arena in Manchester. Flintoff’s Road through the Rainforest for Sky – Freddie embarked on a rainforest adventure, cycling deep into the heart of the rainforest via Brazil’s Trans-Amazonian Highway accompanied by journalist Rob Penn. Special Forces: Ultimate Hell Week for BBC2 in which contestants were put through SAS tasks to find Britain’s toughest recruit. In March 2015, Freddie was crowned the ‘King of the Jungle’ in the first series of the Australian version of I’m A Celebrity Get Me Out Of Here! Along with Robbie Savage and Matthew Syed, Freddie discusses topical sports talking points on Radio 5 Live’s ‘Flintoff, Savage and The Ping Pong Guy‘. Freddie Flintoff is available for Q&A led speeches.